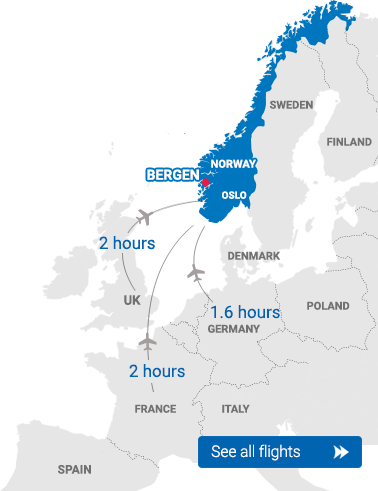 In Bergen you can find a range of different accommodation ranging from exclusive hotels to charming Bed & Breakfasts. In Bergen you can also enjoy some of the finest seafood restaurants in Norway. If you are looking for things to do in, check out the large selecation of activities and attractions. With its ideal location right in the heart of the Fjord Norway region, between the Hardangerfjord and the Sognefjord, it is the perfect starting point for day trips to one of the world’s biggest scenic attractions – the fjords. From Bergen you are real close to the spectacular fjord experiences, either you want to go on a fjord tour or dive into the experience with mountain and glacier hiking in the majestic mountain landscape, skiing in some of Norway’s best terrains, biking along the beautiful fjord arms or explore the wet element with white water rafting or fishing in the ocean along the beautiful coast line. The Norwegian fjords was formed through several ice ages as the sea carved itself through and across the coastline, leaving a beautiful landscape with snow-clad mountains, blue glaciers, deep gorges, cascading waterfalls and tiny fertile villages strung like glowing green pearls along the fjord line. This extraordinary landscape is today inscribed on UNESCO’s World Heritage List, and professional activity organizers are ready to take you into the fjord region all year around – as close to the nature as you can get! Bergen is today Norway’s most international city, packed with history and tradition. 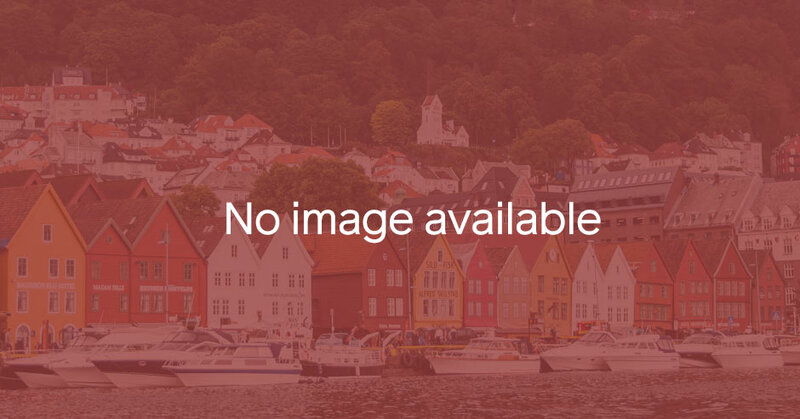 Ever since King Olav Kyrre sailed into the charming harbor and founded the city in the year of 1070, Bergen has attracted people from all over the world. Bergen became an important European city of trade in the 13th century, as the Hansas opened one of their four offices on the wharf, making Bergen a European hub of commerce, seafaring and craftsmanship. Today Bryggen is a reminder of the city’s importance as a part of the Hanseatic League, and has a place on UNESCO’s World Heritage List. A stroll through the back streets of Bryggen brings you back to the Middle Ages, as a lot of the architecture is preserved or rebuilt as it was built. Several museums, like the Hanseatic Museum, Bryggens Museum and the Theta Museum provides a deeper sense of the history of Bryggen, what is has meant for the people of Bergen and Norway as a nation. Bergen is a proud European City of Culture, and the city has had a strong cultural identity ever since the merchants brought life to the harbor around Bryggen at the 1300s. Today Bergen is a cultural melting pot, with a wide range of concerts, international festivals and museums of all kinds. Culture plays an important role of everyday life in Bergen – an important expression of Bergen’s variety of life. Check out the What's on calender to find the events of your choice! Bergen has fostered several world famous artist who have achieved worldwide fame, such as the composer Edvard Grieg and violinist Ole Bull. Grieg’s home at Troldhaugen and Ole Bulls summer paradise at Lysøen are both popular attractions today, where you can experience their homes preserved just as they were built, and concerts to the scenery that once inspired the two world famous composers. The Bergen Philharmonic Orchestra is one of the world’s oldest symphony orchestras, and the city has the country’s first national theatre. The comic writer Ludvig Holberg, Norway’s first major landscape painter Johan Christian Dahl are also world-renowned artist who have influenced the cultural history in Bergen. The city has carried its proud cultural heritage throughout history, and has become a city of great cultural venues. You can find a whole range of museums and institutions in and around the centre of Bergen with exhibitions and performances throughout the year. Bergen is today known for its wide range of music, boasting innovative and trendy music and design scenes with a large variety of festivals. It has one of Norway’s best choirs, jazz musicians and operatic singers. Several bands have emerged on Bergen’s music scene throughout the last decades, like Kygo, Ylvis, Kings of Convenience, Sissel Kyrkjebø, Kurt Nilsen and Sondre Lerche – to mention a few of them. To top all this, Bergen has in recent years become known as an international culinary city, and in 2015 Bergen earned the UNESCO title City of Gastronomy.